Some friends of mine have recently managed to do the improbable and release an album. Their band, Unite Tribe, may not play my type of music, but they are friends, and I will always wish them well...plug to follow!! 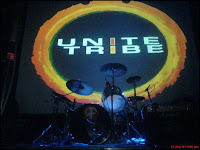 The band, Unite Tribe, have gone from strength to strength – though some nostalgics long for the days that they were called Rastafenians (a name some very smart, intelligent, beautiful and talented woman came up with). These days they play regular gigs to big audiences, and have created quite a following! Their debut album, Enlocarai, was launched in the Temple Bar Music Centre last Thursday, and garnered a huge turnout from friends, family, fans and well-wishers. It was a very successful night, which will hopefully encourage them to continue with their chosen path. The album is on sale in Tower Records at the moment for €14.99, and will be available in a more nationwide capacity from March 29th. I truly wish them the best of luck, and I hope that things continue to go well for them in the future. Good Luck Brian, Barry, Glenn, Sean, Ciara, Sean and Pierre! !